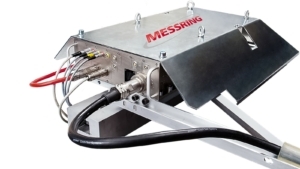 Brake system with servo-hydraulic valve delivering high reproducibility of crash test results and greater testing frequency for sled tests. One of the benefits of the deceleration technology is that the direction of movements is synchronous with the crash rather than inverse, as is the case with acceleration tests. This applies in particular to pre-crash braking scenarios that are virtually impossible to simulate using an acceleration system.